This was no defensive masterclass from either Thornton Hibs Under 19s or Elgin Star, but it was a gutsy performance from the young Hibs given that they’d been 4-1 down at half-time. Ewan Divertie gave the home side an eighth minute lead and not long at the back of that, Murray Neep’s wind-assisted free-kick from just inside the Hibs’ half was missed by everyone and ended up nestling in the back of the net. In the 16th minute, Robbie Hall’s free-kick was diverted into his own net by Travis McBride. Perhaps a mixture of Elgin taking their foot off the gas plus the Hibs finally awakening from their slumbers saw Thornton reduce the leeway in the 22nd minute when Jack Hoskisson stole in at the back post to score. Divertie scored his second and Elgin’s fourth shortly before the interval against the run of play. In the 59th minute, Callum Murray impeded Hoskisson in the box and Ryan O’Donnell netted the penalty. The deficit was cut to two when Josh Sinclair followed up to smash the ball home from 20 yards after Archie Watson’s shot smacked off the upright. Thornton were throwing everything at their opponents which left them short at the back. 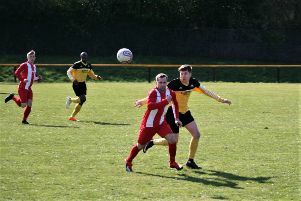 Luke Gardiner exposed this frailty in the 73rd minute by running unchallenged from the half-way line before coolly clipping the ball behind the advancing Inness Pirrie. Substitute Callum Pirrie cut Elgin’s lead to just one in the 73rd minute and, with one minute remaining, O’Donnell’s low cross was inadvertently knocked into his own goal by Neep.